This is required equipment for all participants including NATO and Warsaw Pact. 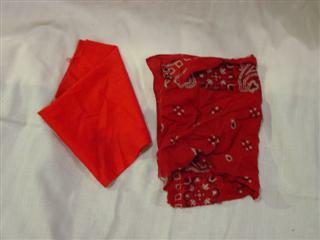 Each attendee is required to have a minimum of two red dead rags. A dead rag is nothing more than a swatch of red cloth used to signal that you are hit. Dead rags do not have to be anything fancy. Red Shop rags, handkerchiefs, or any swatch of red cloth will do. These do have a tendency to get lost when you stick one on the top of your helmet, then walk through the woods. Two are required, but more may be helpful. This page was last modified on 13 September 2013, at 14:56.